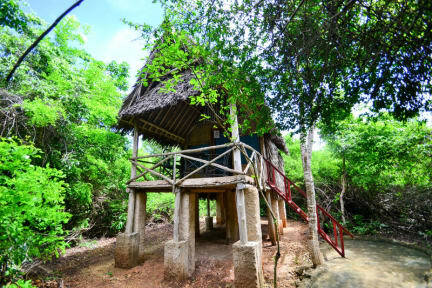 Stilts Backpackers Diani Beach offers beautiful eco friendly tree houses, cottages and camping tents set in the midst of 7 acres of tropical forest and just a short 300 meter walk from the stunning beach and central Diani. Set in amongst the tree tops, with a friendly atmosphere and famous good service we invite you to join us for a relaxing stay surrounded by local wildlife and beautiful forest. It has a relaxed atmosphere. It consists of 5 tree houses and 4 cottages. While staying with us, you have access to our beach front hotel called Stilts On The Beach (aka Flamboyant Hotel), you can use the outside swimming pool and sun loungers, and order from the restaurant and bar. 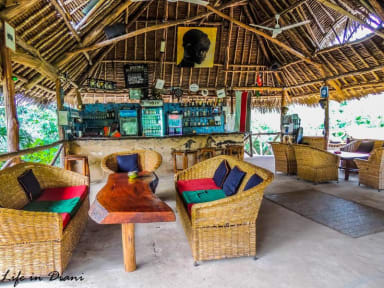 Stilts is located in the center of Diani beach. We are within a 5 minute walk or drive to many banks, hospitals. super markets, restaurants and bars. We have very cheap access to public transport on our door step. We encourage our guests to go out and explore Diani and her surroundings. The Beach is 300 meters from Stilts. Access is through Stilts On The Beach (aka Flamboyant Hotel). A short 5 minute walk. We also have water sports available at an additional cost - kayaking and kite surfing. Beds available in single, double, twin or triple. Well-maintained communal toilet and shower block. Some rooms have ensuite bathroom. Mosquito nets and towels provided for free. If you are going to be arriving between the hours of 11pm to 7am please let us know so we can arrange for someone to meet you. We can arrange for a taxi service from Mombasa for 3500KES. We have a few rules at Stilts to help make your stay as safe and hassle-free as possible. The most important rule is Do Not Feed The Monkeys! Save this urge for the bush babies that come every evening to the ba around sunset for bananas! Feeding the monkeys makes them fearless of humans and encourages them to steal the food off your plate and ransack your room for a free meal.